ASUSTOR NAS provides comprehensive support for all 13 Windows ACL file permissions, allowing for close integration with AD domains and providing simplified IT management and increased productivity. According to needs, IT professionals can enable and disable Windows ACL for specific shared folders and can use ADM File Explorer or Windows Explorer to configure permissions. Configured ACL permissions can be applied to Samba, File Explorer, AFP, FTP and WebDAV protocols, avoiding the need to configure permissions for each individual protocol and avoiding human errors that could cause access leaks. Furthermore, in order to allow files to maintain their original ACL settings after they have been moved to the NAS, ASUSTOR NAS supports the free 3rd party software FastCopy, for this unique job. 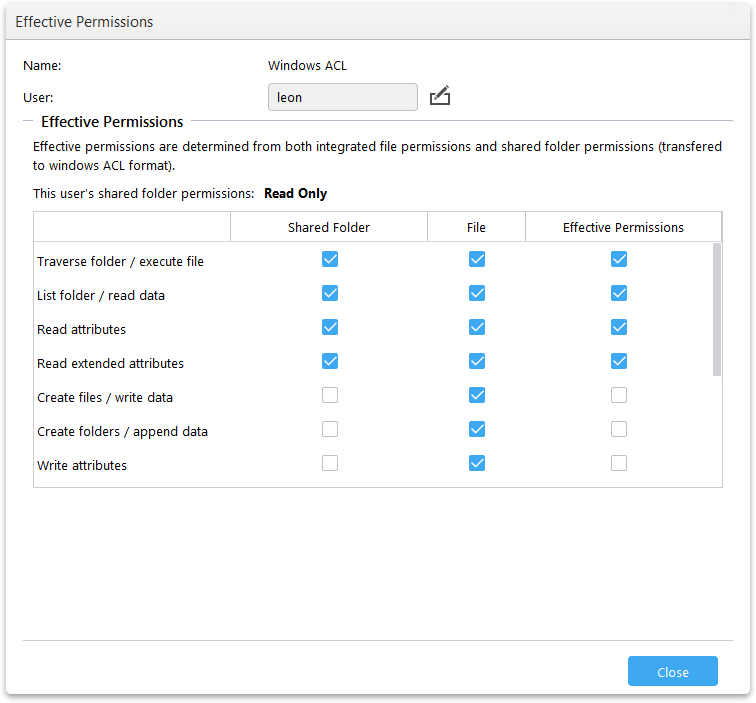 After enabling ACL, a user’s effective permissions will be determined from the combination of Shared Folder Access Rights and ACL File permissions. ADM File Explorer features a page that clearly lists the “Shared Folder Access Rights”, “ACL File permissions” and “Effective Permissions” for the item selected, allowing administrators to conveniently make any adjustments.